Andrzej Chyra, Malgoska Szumowska and Mateusz Kosciukiewicz at the photocall of "In the Name of" during the 63rd Berlinale International Film Festival. Andrzej Chyra at the premiere of "In the Name of" during the 63rd Berlinale International Film Festival. Mateusz Kosciukiewicz, Maja Ostaszewska and Andrzej Chyra at the premiere of "In the Name of" during the 63rd Berlinale International Film Festival. Andrzej Chyra and director Malgoska Szumowska at the photocall of "In the Name of" during the 63rd Berlinale International Film Festival. 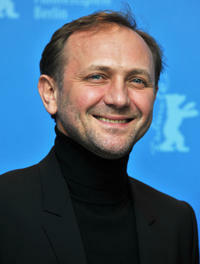 Andrzej Chyra at the photocall of "In the Name of" during the 63rd Berlinale International Film Festival. Andrzej Chyra, Maja Ostaszewska and Andrzej Wajda at the photocall of "Katyn" during the 58th Berlinale Film Festival. Angela Merkel, Andrzej Chyra and Magdalena Cielecka at the premiere of "Katyn" during the 58th Berlinale Film Festival. Andrzej Chyra at the photocall of "Katyn" during the 58th International Berlinale Film Festival. Volker Schloendorff, Andrzej Chyra and Marek Prawda at the German premiere of "Strajk." Andrzej Chyra, Maja Ostaszewska and Andrzej Wajda at the photocall of "Katyn" during the 58th International Berlinale Film Festival.